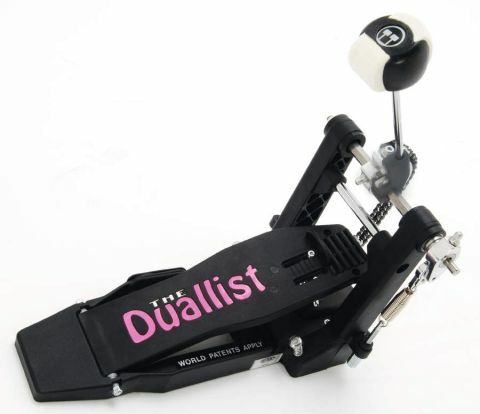 There's no doubt that Duallist's trick double and triple pedals have been responsible for garnering the brand all sorts of attention in the past. But they're not for everyone. The D1 and D2 pedals are Duallist's mass appeal products, but they've sacrificed little in terms of character in order to hit that point. There's a premium to pay. Bigger, better, faster, more. Isn´t that the way of progress? Apart from the ‘bigger´ bit (hi-tech stuff just gets smaller and smaller), the phrase does seem to sum up what we all want and what manufacturers strive to give us. And it applies even to the humble bass drum pedal. The immediately remarkable thing about these pedals is their lightness. They may be better and faster than others too but it´s their relative lack of weight that impresses on initial inspection. This is the result of Duallist using DuPont Zytel polymer as a raw material for the chassis and baseplate of the D1 and D2 duo. Sounds hi-tech? It is. Designed for situations needing a tough, load-bearing material or where high temperatures are involved (when playing blazing double bass parts, perhaps), Zytel is used in Audi´s awesome V8 TDi engine and a brand of Turkish coffee machine amongst others. So Duallist pedals are in good company on that front. The units aren´t flyaway in terms of their weight, however, and they lack nothing in terms of robustness and rigidity. The design of the pedals - and specifically the way that the frame and baseplate are integrated - eliminates any discernible flex, which bodes well for transfer of energy from the foot to the bass drum. Talking of bass drums, one of the pedals´ neatest little features is a sliding clamp that allows you to alter the distance between the pedal and the kick drum itself. Slacken off the two bolts on either side of the clamp´s top jaw and simply slide the section forward or back and tighten them again. It takes but a minute and although it might not be something that we´ve all been clamouring for, the extra tweakability is welcome. Much of the rest of the D1 and D2´s modus operandi will be familiar to those who have owned or used other high-end pedals. And the general feeling with this pair is that they´re a match for various other good stuff that´s out there. Every last element here is of sufficient ruggedness to inspire real confidence in its longterm, real world abilities - and the smoothness and efficiency with which the components work together is befitting of high-end pedals. The D1 and D2 stick to tried-and-tested functional principles rather than sporting features like DW9000´s series, with its Free-Floating Rotor Drive and infinitely adjustable cam. But that´s not to detract from their qualities. The level of adjustability and ‘personalisation´ on offer here is everything that you´d expect, from spring tension to beater angle and chain adjustment. There´s also a slickness to the pedals´ feel that is extremely welcome. As such, whatever you´re after in terms of tactile response and resistance is only going to be a few allen key fiddlings away. Both the D1 and D2 should find favour with a broad audience, despite what their leery looks might suggest. If you´re a real die-hard fan of the snatchy, super-quick feel of some offset cams, you might not get on with the Duallists as well as others will. But this is an observation common to any pedal that doesn´t sport such a feature. It´s not a criticism and for the majority of players, either of these two will offer plenty of appeal. Another particularly gratifying aspect of the Duallists´ performance is their near-silence. A boon for recording drummers in quieter settings, the complete lack of squeaks and creaks (due in part to their largely non-metallic nature) increases the overall perception of smoothness. Not a deal-breaker if you´re in a death metal band of course, but it´s attention to details such as this that ensures the Duallists will hold their own in some elite company. While Duallist´s previous offerings stood out on their own, with little or no alternatives where the double and triple units are concerned, the D1 and D2 pedals place themselves directly in competition with some real heavyweight favourites. That would be seen as folly, if it weren´t for the fact that the pair stand up to scrutiny so well. As a result, the market is now home to another perfectly valid and individual pair of pedal choices.